This week I cover how to back up your data in BeerSmith 3 as well as automatic data storage and archive options. I’ll show you how to recover a large amount of data or even just an older recipe if needed. Since the bulk of your brewing data is locally stored, it could be lost if you have a hard drive crash, stolen computer, hardware failure, fire, or other disaster. This is why I strongly recommend periodically making a backup of your Documents/BeerSmith3 folder. An even better idea is to use backup software that either backs your data up offsite or to a network archive. 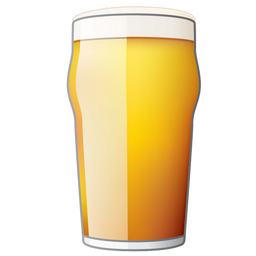 If you have a complete copy of your BeerSmith3 data directory it is very easy to copy the entire directory to a new computer or alternately open the BSMX data files within BeerSmith to recover selective data. For example your recipes are stored in a file called Recipe.bsmx which you can easily open using the File->Open command within BeerSmith, and then copy/paste data back to My Recipes to restore recipes. You can do the same for other data like the Equipment.bsmx or Hops.bsmx files. I do not recommend moving/storing your BeerSmith 3 data on an external or network drive or service like Google Drive or Dropbox for daily use. While a number of users have tried this to share data between machines, there is nothing in BeerSmith that will prevent one copy from overwriting another on the shared drive if you run two copies on two computer. The result in this case will most likely be data loss. Instead, it is best to periocally back up your local BeerSmith3 directory to your backup or network drive for archive purposes. In addition to the basic data storage there are a number of automatic backup features in BeerSmith 3 which can help you recover data if needed. For example BeerSmith makes a copy of your recipes after major operations like edits and deletes in the “Recipe Archive” and also has an automatic bulk backup of your recipes and ingredients stored separately for easy recovery if you have significant data issues. For recovering individual recipes such as one you changed or accidentally deleted you can use the Recipe Archive feature. Go to View->Recipe Archive to view the archive. It stores copies of every major change you make to your recipes for a period of time, so you can easily search by recipe name and see all of the changes you made to a recipe. It also saves recipes before deleting them so you can recover deleted recipes from here. Within the recipe archive, the recipes are shown by date and folder. To view a recipe just double click on it, and on any viewed recipe you can use the Save a Copy button on the ribbon to recover it. You can control how long recipes are retained in the archive by going to Options->Advanced Options and setting the Keep Archived Recipes for option near the bottom of that dialog. In addition to the recipe archive, BeerSmith also stores bulk backups of your recipes, ingredients and profiles. 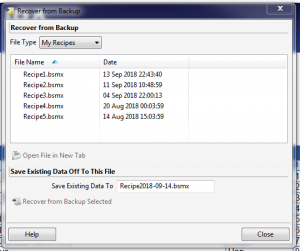 You can access these complete backup files from the File->Recover from Backup dialog. Five copies of each major file are stored and the older files are rotated more slowly so you can access older data. Also in BeerSmith 3 these files are stored separately from your Documents/BeerSmith3 data so you have some additional insurance if you accidentally delete your Documents/BeerSmith3 directory. From the recovery dialog you can select the data type as well as any of the data files by selecting them. I recommend using the button to Open File in a New Tab to view the data before doing a full recovery to make sure you are recovering the data you want. You can also use the view in a tab option to view older files where you may want to recover just a few items. The Recover from Backup Selected button will do a full replacement of your data with the selected file, wiping any data you already have in place so it should only be used after you have verified you have the correct bulk backup file. Those are some of the new backup and recovery features in BeerSmith 3 as well as the important data to back up to avoid data loss. You can learn more about the features in BeerSmith 3 here or purchase a copy from the main order page here. Thanks for joining me on the BeerSmith Home Brewing Blog. Be sure to sign up for my newsletter or my podcast (also on itunes…and youtube…and streaming radio station) for more great tips on homebrewing.